What may at first appear to be a small water stain on your ceiling could be just the tip of a costly iceberg. Most damage occurs on the side you can’t see, and by the time you have a visible leak, it is often too late. Even worse, your damaged ceiling is a perfect breeding ground for mold, which can pose a serious health risk. Addressing water damage to your ceiling should thus be a priority. Is Ceiling Water Damage Covered by Insurance? Depending upon your insurer, water damage may be covered. Insurance agencies differentiate between flood and water damage based upon whether the water hits your home before touching the ground outside. Water damage may include roof or plumbing leaks, depending upon your policy. In some cases, mold damage is also covered. Due to the similarities between flooding and water damage, it is best to discuss any damage with your agent as soon as possible and to carefully document the damage. In some cases, a claim may be turned down if not filed properly. If you are unsure about whether your insurance policy covers water damage, it is best to consult with your insurance provider before attempting any repairs. As with many other home repair projects, you can often fix a damaged ceiling yourself. This is especially true of a drywall ceiling. Thankfully, you will rarely have to replace the entire ceiling. Self-adhesive drywall mesh – This metal mesh is useful for patching holes in drywall and provides a means to support your spackle. Unfortunately, mesh repairs tend to sag when used on ceilings and are thus not a good choice. Drywall access panels – One option that has seen some popularity growth is the installation of a drywall access hatch when repairing a section of damaged ceiling. Not only does the hatch installation replace the damaged portion of drywall ceiling, it also provides a means to inspect periodically for further damage. Hatches are especially useful when installed under plumbing that is known develop leaks. Replacing an individual section – Perhaps the most popular method is to simply cut out the damaged section of drywall and put a new panel in its place. This works best in smaller areas, although high ceilings may be more difficult to work on. The cost of one panel, a gallon of compound, a four-pack of screw setters, and a roll of tape will generally run about $23 at places such as Home Depot, making this a relatively inexpensive project if you have access to the tools. There may be wires or other delicate items located above the damaged portion of your ceiling. If you cannot access the space to check the area, carefully cut a small hole using your utility knife. Use a flashlight and small mirror to check the area for potential problems before attempting to cut out the section. Once you have determined where to cut, use your jab saw to cut a rough square around the hole. Do not worry about straight edges yet. If the leak is near a metal drywall ceiling support, your cuts will be restricted to this area for now. Be sure to cut some distance from the damaged portion. You may also wish to use some homemade mold spray around the area before proceeding to kill any mold spores which have taken root. Using your square, pencil out the edges around your repair area. Be sure to make your lines partially overlap any metal drywall runners for better anchoring. Gently score the covering paper along the lines with your utility knife, then insert and rock the blade back and forth along the scored lines, making several passes. Finally, finish with a longer deep pass. Do this process for all four edges. Take the plywood board and place it inside your opening along an edge opposite a drywall runner. Use your drywall screws and screw setters to attach the plywood brace to the inside of the existing drywall, leaving a two inch clearance. One screw per side is sufficient, and you do not need to screw a side which connects to a runner. The braces and runners will provide a sturdy flange on which to mount the replacement drywall piece. Measure and mark the dimensions for the replacement panel using your square and paper. Be sure to make your new panel between one-eighths and three-sixteenths of an inch smaller than the opening you are filling. This will keep the panel from binding. Carefully cut the board, then trim to fit with your utility knife. Use four drywall screws to fasten the panel to the backer board and metal runners. Apply the self-adhesive fiberglass drywall tape along the joints to create a seal. Next, apply a thin coat of joint compound over the tape with the smaller putty knife. Immediately after coating the tape, spread a thin coating of compound with your 12-inch blade, feathering the edges as you go. It is important to work quickly, as the compound does not take long to dry. Only a thin layer is needed, as you will need to sand off the excess. Allow the patch to dry overnight. Take a wet sanding sponge and gently smooth out any high spots and feather the edges to help the patch blend in. Be sure to wring out any excess water and rinse the sponge when necessary to prevent any clogging from compound debris. Allow to dry. You may wish to add a second layer of compound and repeat the drying and sanding process. As a final step, paint the area over. You may wish to take a piece of the removed drywall for color matching if your ceiling is a particular shade or the patch is otherwise visible. There are a few circumstances in which you may choose not to replace the damaged ceiling. This may include water marks from a previous roof leak or marks from a major storm where water soaked through. The repair is cheaper, but not advised if there is extensive damage on the hidden side of the ceiling. Use some homemade mold spray and make sure the area is dry before proceeding. Use hairspray to seal the stained area. Then, apply a coat of primer with stain blocker to further seal the area and hide the stain. You may wish to paint over the area as a finishing touch. 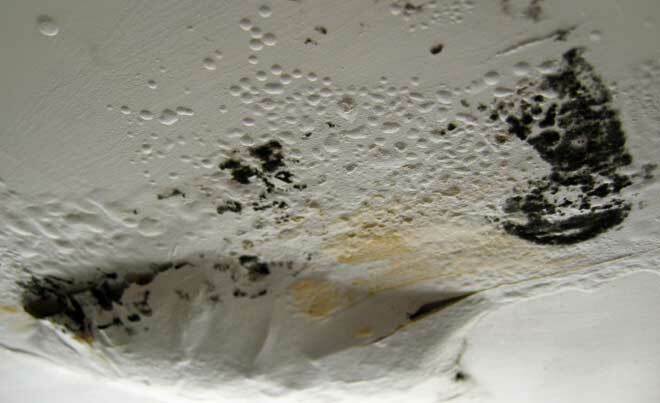 Mold thrives in damp areas and can not only damage your ceiling further; it is also a serious health risk. Mold can contribute to asthma and other respiratory issues. In some cases, it can even prove fatal with prolonged exposure. Remove any nearby furniture and lay plastic on the floor to reduce the risk of bleach damage. Next, spray the area liberally and scrub it with your sponge. In order for the next steps to work more efficiently, you will need to make sure to remove all traces of dirt. Open any doors or windows for ventilation. Add a concentrated blend of equal parts warm water and bleach to the bucket. Take your brush, dip it in the bleach, and scrub the moldy area. Be careful of splashing, as the bleach may discolor nearby walls or furnishings. The removal process is rarely quick, so take breaks as needed. When there are no traces of mold left, apply more bleach solution and let it soak for 15 to 20 minutes. This will destroy any remaining microbes. Finish up by drying the area thoroughly with a clean cloth. Even if you don’t notice mold around the damaged area, you may wish to use a spray to kill any spores which are present. Take an empty bottle and fill it with a solution of one part bleach to two parts water. Spray the area thoroughly, being careful not to get it in your eyes. Make sure there is proper ventilation and allow the area to dry completely before attempting any further repairs. Depending upon the amount of damage or your confidence in handling the work yourself, you may opt to hire a professional to repair or replaced the damaged ceiling. According to CostHelper, professional repair of a water-damaged ceiling will run between $100 and $300. Inspection of the damaged area is often provided free of charge. Esurance provides a short guide on what may be covered by your insurance and how to spot mold. 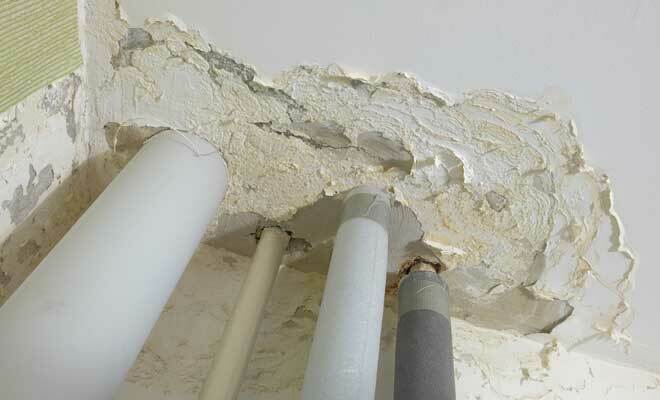 HomeAdvisor offers a free searchable database of ceiling repair contractors.